System.Data.EntityException: The underlying provider failed on Commit. System.Data.SqlClient.SqlException: Timeout expired. The timeout period elapsed prior to completion of the operation or the server is not responding. System.ServiceModel.EndpointNotFoundException: There was no endpoint listening at http://server:4712/CompanyService.svc that could accept the message. This is often caused by an incorrect address or SOAP action. The installation package included with AX 2012 R3 is for Management Reporter 2012 CU9, so we recommend using the stand-alone installer for CU9 or later. 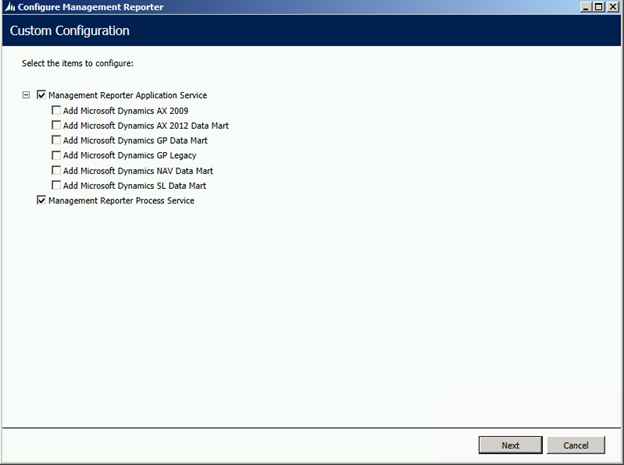 You should deploy both Management Reporter services (selected by default as show above) before deploying the Data Mart integration.